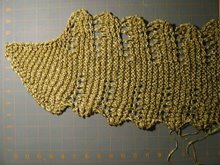 Lisa's made some suggestions about the Reptilian pattern, particularly the need for a close-up of the pattern stitch and the end portion. 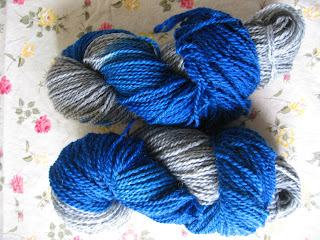 Here's a shot I took with indoor lighting to remove the distracting sheen of the yarn. 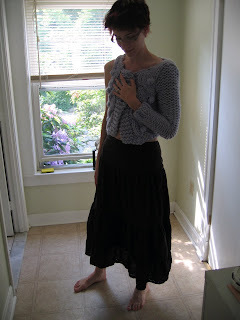 It's actually the photo I submitted to Magknits when I proposed the pattern! I hope this helps. 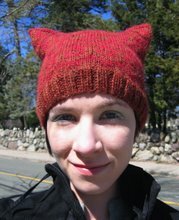 I'll post it to my sidebar right by the link to the Magknits pattern as well. 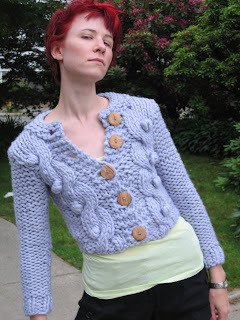 In the spirit of Twinkle's Big City Knits, I present the finished Best Friend Cardigan! First, the instructions in the book are more of an outline. I don't recommend this garment for beginners for this reason: it requires keeping track of cable-turning, side shaping, and buttonholes without much guidance. 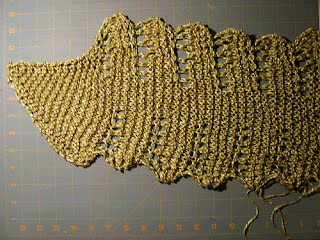 Additionally, sewing it together took four or five tries with different stitches, stitch lengths, and yarns in order to make the seaming look professional. Whew! I settled on mattress stitch with one ply of a 3 ply purple yarn that is slightly darker than the sweater. Sizing? This is the smallest size. 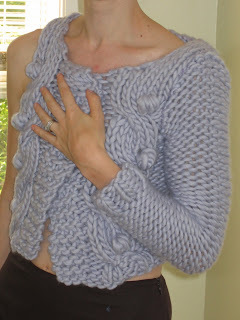 However, this is a very dense and thick sweater, and the seaming around the arms and shoulders would, I believe, be very unflattering for anyone with large shoulders. Honestly, I think this would look nice on larger, curvier body types, as long as the shoulders are small in relation to the bust and waist. The yarn is really, really soft. I would compare it to Cascade Magnum, which is loosely spun and tends to split as it is knit, but this is even softer. This sweater has been washed and blocked, and there is no pilling at all. 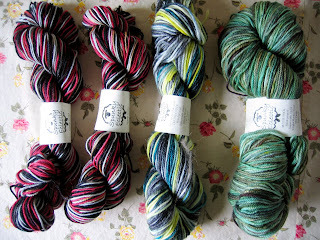 Next post: yarn gift from Eastern Europe and upcoming socks! 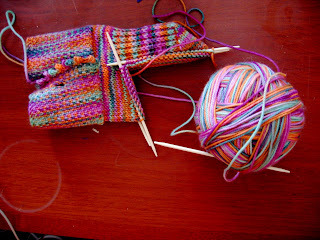 Elinor has knit some bright and pooling socks that she is sending me in trade for some subtly-dyed purple Sea Wool I sent her. 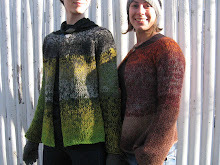 We have similar taste, I find, with the exception of the fact that I like weird bright pooling yarns. Hooray trades! New sweater, new hair color, new feeling of gathering wellness. Despite a serious sore throat and inflamed lymph nodes today, the mending continues. I see myself wending a slow path to the gym by the end of the week. Back to the land of the living. Ugh, this past week has been illness far beyond what that last post communicated. Coughing and coughing and losing about 90 percent of my voice for three days. Work was absurd; I had to answer the phone in a hoarse whisper. This weekend I've done nothing but sit on the couch, sleep when I can between bouts of coughing, and get better. Oh, and I've almost finished the Best Friend C ardigan from Twinkle's Big City Knits. Right now it's actually blocking. I made the smallest size, let's call it "infant." In any case, I was worried, for perhaps the first time in my years and years of knitted garments, that it would be too small. Then I soaked it and gently laid it flat, and it really stretched out. I envision fabulousness. 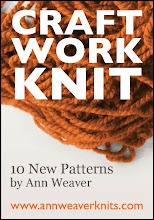 I'll give my final thoughts on the garment and book and yarn when it's all done. In other illness knitting news, I learned linen stitch to work on my Rock and Weave socks from Blue Moon Fiber Arts, last year's sock club. This pattern has all sorts of bells and whistles, and reminds me why it's im portant to work from others' patterns to learn new tricks as well as do my own designs. The cuff is linen stitch, more weaving than knitting, and then stitches are picked up along the bottom and knitted around into the heel and instep. The colorway is "fairgrounds." Oh, and I knit a Green Gable. All this progress that comes from being laid up. It's also blocking... photos outdoors soon! 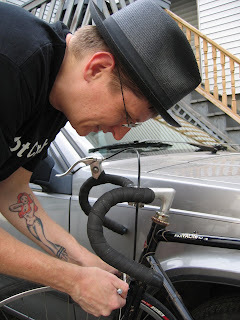 Chris made something this weekend as well: a single-speed road bike from an old 10-speed frame, a lot of salvaged parts, and some cheap tires. It rides rather nicely (despite the illness I let myself take it up the hill behind our apartment and back) and is actually more effective on hills than my mid-weight hybrid. I'm sick of carrying that weight around, even though it's gotten me in great shape... we're saving money in an envelope for a road bike for me by the end of the summer! Rolls of toilet paper and boxes of kleenex! Those really nice people at the JP Licks across the street from work who make me wonderful milk shakes every day for lunch so I can have nutrition! Good job, everyone! It's been a team effort! Since I'm drowning in my own congestion right now, I'll show you the loot from Maine this weekend! 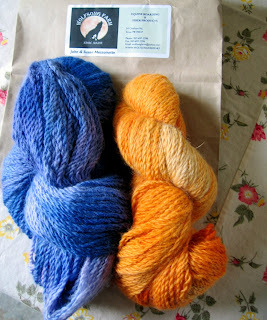 First, two skeins of "Friends Blendz" merino and mohair from Friends' Folly Farm. It's destined for a Christmas present... the colors of this yarn captivated me and Chris. 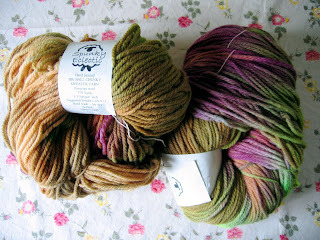 Two skeins of Big Ball Chunky Peruvian Wool from Spunky Eclectic in the Vineyard colorway. 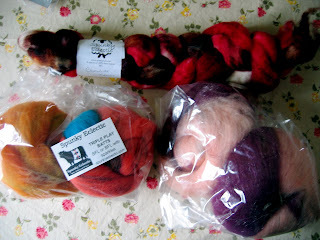 I love Amy's yarns and fiber, and it was overwhelming to see so much of it in one place! These are for a basic raglan cardigan that I'll wear to the gym instead of my ancient zip-up Harvard hoodie. There were some other Spunky Eclectic purchases, including Super Sport Sock in Diet Coke, and some other sock varieties that were on sale. Oh, and some fiber: BFL and some "triple play batts," with and without sparkle. Yep. There was also some angora and merino blend from Wolfsong Farm. Susan, the owner, was so nice, and this fiber, intended for baby things, is as soft as can be. And there was more. But coughing has taken over, and the more will come, I hope, tomorrow. 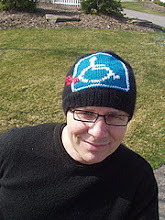 This is the test project I've been crocheting, designed by Monica Brown, who gave me permission to post the photo here. You can reach her here. She promises that she will be making the pattern public soon. This one is the extra-small size (31 inch bust), made with 5 balls of Rowan Calmer in Plum. I have already worn it twice and been besieged with compliments. 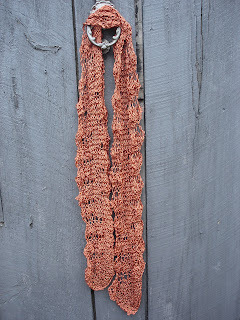 You too can make one, even with the most rudimentary crochet skills. Thanks, Monica! 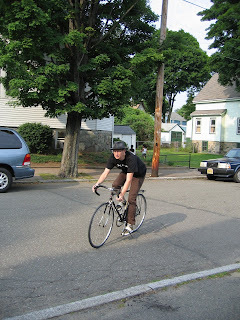 Tomorrow I'm off to the Fiber Frolic and, if the weather permits, a lot of biking in mid-coastal Maine this weekend! 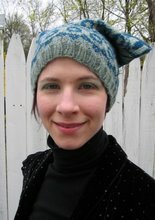 Weaverknits Designs Free For You! You know you wanna. 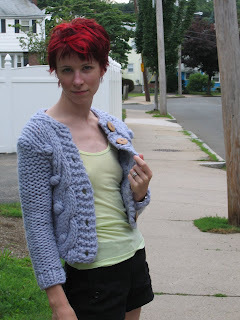 Weaverknits is online at MagKnits and free here on the blog! 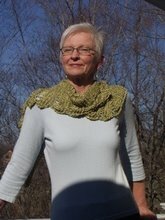 Check out my mom rocking the Reptilian scarf my sister Beth and I designed. 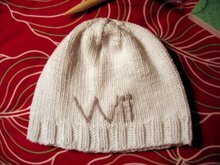 The Wii hat pattern is also available -- free at the link on the right! Download your PDF now! AND WASH YOUR SWATCH!